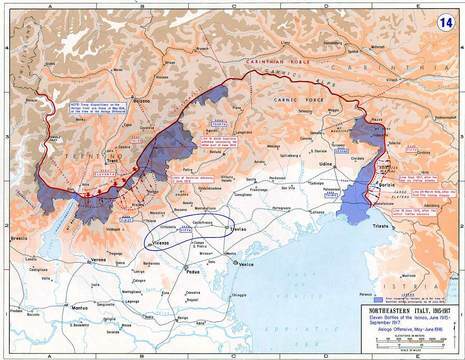 The Eleventh Battle of the Isonzo was a World War I battle fought by the Italian and Austro-Hungarian Armies on the Italian Front between August 18 and September 12, 1917. The attack was carried forth from a front from Tolmin (in the upper Isonzo valley) to the Adriatic Sea. The Italians crossed the river in several points on temporary bridges, but the main effort was exerted on the Bainsizza Plateau, whose capture was to further the offensive and break the Austro-Hungarian lines in two segments, isolating the strongholds of Mount Saint Gabriel and Mount Hermada. 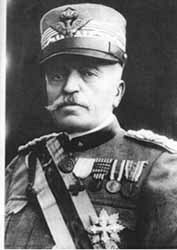 After fierce and deadly fightings, the Italian Second Army, led by General Capello, pushed back Boroević's Isonzo Armee, conquering the Bainsizza and Mount Santo. Other positions were taken by the Duke of Aosta's Third Army.